Shares of utility PG&E fell 21 percent on Wednesday after the company said its insurance wouldn’t cover its cost if it’s found responsible for the Camp Fire. “If the Utility’s equipment is determined to be the cause, the Utility could be subject to significant liability in excess of insurance coverage,” the company said. The utility company also discloses that it submitted an “electric incident report” to the California Public Utilities Commission on Nov. 8, just before the wildfire. A PG&E map of the Camp Fire area, exclusively obtained by this news organization, raises new questions about the utility’s power-shutoff policies and its decision to keep electricity flowing in advance of the deadly and destructive blaze. The map, received from a PG&E official by Butte County chief administrative officer Shari McCracken, includes red lines overlaying the towns of Paradise, Magalia and others like a swarm of aggressive tapeworms. The red indicates the distribution lines that PG&E had planned to de-energize in advance of high winds and other dangerous fire conditions forecast for the morning of Nov. 8 — a plan the utility ultimately decided was unnecessary. Trading in shares of Pacific Gas & Electric (PG&E) resumed this morning after initially plunging 23% and halting due to volatility triggered by damage from the Camp Fire in Butte County, California, which CalFire recorded as starting soon after the utility experienced an outage on Thursday morning. PG&E filed an electric safety incident report Thursday evening, reporting to the California Public Utilities Commission (CPUC) news of the outage and damage to a transmission tower “approximately one mile north-east of the town of Pulga, in the area of the Camp Fire.” The cause of the fire remains under investigation. Camp Fire has become the most destructive fire in the state’s history, burning more than 6,700 buildings and killing at least 29 people. PG&E equipment has been the cause of several deadly wildfires in the state, and the investor-owned utility (IOU) has incurred more than $2 billion in costs, net of insurance recoveries, related to wildfires so far this year. But for reasons that remain unclear, the utility decided not to shut off power that day. On Oct. 14, the company cautiously shut off power to some 60,000 Sierra foothills and North Bay customers, hoping to prevent any downed power lines from sparking a fire. On Nov. 6, PG&E again began warning 70,000 customers — including those in the town of Paradise — that it might flip the switch in the face of fire danger. 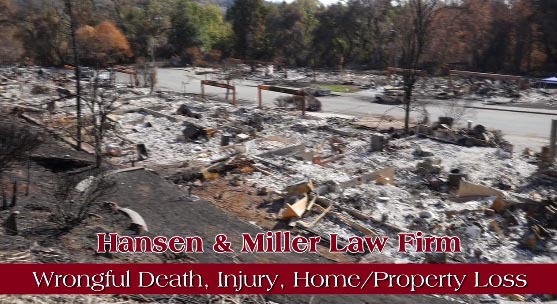 A meeting was held in Gridley, Tuesday night, hosted by the California Wildfires Lawyers — a group of lawyers from across the state who specialize in helping people impacted by mega-fires. CALIFORNIA — Although no cause has been determined for the Camp Fire, a growing number of survivors are placing blame on Pacific Gas & Electric [PG&E] and say they plan to sue the utility giant. One of those considering joining the fight, Jim Haunstein, who lost his home in Paradise. He said in the weeks before the fire, PG&E workers came to his home and marked some of the trees on his street for trimming. With the cause of California’s deadliest-ever wildfire still officially under investigation, some of the evacuees are already joining a lawsuit against power company Pacific Gas & Electric (PG&E). SAN FRANCISCO — People who lost homes in California’s deadliest and most destructive wildfire sued Pacific Gas & Electric Co. Tuesday, accusing the utility of negligence and blaming it for the fire. PG&E did not maintain its infrastructure and failed to properly inspect and manage its power transmission lines, according to the lawsuit filed in state court in California by more than two dozen fire victims. 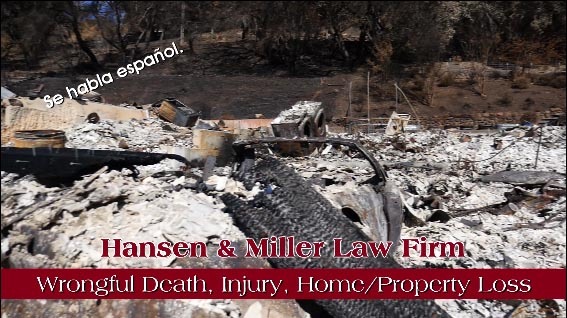 The fire that killed at least 48 people and devastated the Northern California town of Paradise was a “direct and legal result of the negligence, carelessness, recklessness, and/or unlawfulness” of PG&E, the lawsuit said. The lawsuit seeks compensation for the plaintiffs’ losses and unspecified damages. Residents in the city of Paradise filed suit against PG&E in San Francisco Superior Court on Tuesday, alleging that the utility company’s negligence and faulty equipment generated the deadly Camp Fire, which has burned over 130,000 acres in Butte County, destroyed thousands of homes, and killed dozens of people. Attorneys with Millbrae-based Corey, Luzaich, de Ghetaldi, and Riddle excoriate PG&E’s safety record, claiming that “the Camp Fire started when a high-voltage transmission line failed, igniting vegetation.” The lawsuit hopes to place potentially expensive legal liability for the deadliest and most destructive California fire on the utility company.